Some of you may recall that earlier this year I blogged about the Tokyo Quilt Festival I attended this year. I blogged about it here and here. It was amazing to be able to go there and to share with you my experience there. Well, I am definitely going back there in January next year. Since I will be living MUCH closer to the Tokyo Dome, where the festival takes place every year, I might, in fact, I WILL probably be able to visit there a few times next year so that I won't miss anything, hopefully, hehe. Each year the Tokyo Quilt Festival exhibits lots of Partnership Quilts, which are made by quilt blocks submitted by everyone. 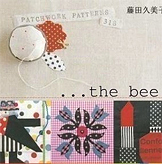 A theme for partnership quilts is set by a popular Japanese quilter/textile designer annually, and she will put all blocks submitted into groups. Folks there will piece all blocks and make them into quilts accordingly. 2011's theme was "Flower" and there were 10,344 blocks submitted total from all over the world. Under supervision of Yoko Saito, an author of many Japanese sewing books, those blocks turned into 86 quilts to be exhibited at the festival. They did a great job on putting similar blocks together and I so enjoyed seeing many flower themed quilts there. I'd like to invite ALL of you to participate in this for next year. 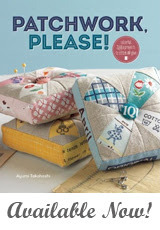 I am especially excited about next year's partnership quilts, because my super quilting hero Suzuko Koseki, an author of these awesome sewing books, will be a supervisor. Triangles and squares. This doesn't mean your block needs to consist of perfect triangles and squares. Half triangles, rectangles, etc are all good. What's the block size requirement? 22-23cm x 22-23cm ; 8 3/4" - 9" x 8 3/4" x 9" including 1-1.5cm or approximately 1/2" seam allowances. 1) Your name written by a permanent pen at the right bottom corner on the seam of your block. 2) A piece of paper with your info - Your message, your name, address, and phone number. How many blocks can I submit? One per person. If you are sending blocks as a group or a family, limit 5 blocks. And remember to include a piece of paper with personal info for EACH block. Also, even if you send several blocks together, these blocks may not be in the same quilt. What's the technique we can use? 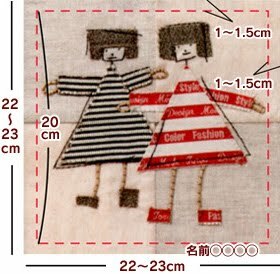 Any :) Machine or hand-sewing, paper-piecing, applique, embroidery. Just keep in mind that your block will be quilted so I would avoid attaching a giant metal piece or anything like that. Does my block need to be original? Not at all! Go ahead and pick your favorite quit pattern from your book. And of course you have free reign to come up with your own blocks design. Is there any requirements on colors or types of fabrics? Not at all! Use fabric you want and pick the colors you want. Do I have to be an experienced quilter to join this? Not at all! The youngest participant this year was a 2 year old! Can I see the quilt my block is in? Absolutely! If you can join this flickr group and post a picture of your block, I will do my best to look for your block at the festival and take pictures of the quilt to share with you all on my blog and in the flickr pool. When will the 2012 quilt festival be held? Sometime in January next year. The specific dates are undecided,but I am assuming it will be about 10 days in late January. What happens to the quilts after the festival is over. They will be sold for charity purposes at the end of the last day to help the victims of the earthquake. August 31, 2011. Your blocks must arrive by this date. If you are going to use the USPS first class international mail to send your block from the U.S., I would suggest that you send it by August 10th. Where should I send my block to? I hope you'll jump in the fun! Have a great Monday!! This sounds like a really worthwhile project - I think I will have a go and pass the word thro my blog too. this is so exciting Ayumi!! Thank you so much for explaining and translating, I looked at the partnership site but all I got from that was a pretty flower. Well, shoot. As I read thru there, my mind was planning a full metal block. HA! So nice of you to translate all this Ayumi! I was first introduced to Suzuko Koseki's fabrics through your blog post about the coaster project for her last year, and now I'm totally addicted! Thank you so much for all the info! I'm so excited to participate! eeek! super excited to do the block hunt next year! Everytime I come across the words "Tokyo Quilt Fest", my hearts beat faster! I remember how I would go every day, when I used to live there! I'll do it too and pass the word on my blog! Oooh yay! I'd love to take part and I've joined the Flickr group! That is an invitation that is hard to refuse, Ayumi. Thanks for telling us all about it! I have a block in mind already!! Hi, new to comment but have been visiting your wonderful blog quite regularly! I have a small sewing club here in Bangkok, Thailand and I will mention this to my friends and send our blocks in too! Thanks so much for sharing and LOVE your blog!!! Please drop me an email if you ever are in Bangkok too! I am in! :) Great! Thanks Ayumi - I would love to do this. I have put a post on my blog today. I hope you get lots of beautiful blocks - what a fabulous cause! What a fabulous idea and for such a wonderful cause. I`ve blogged about it today - I hope you receive lots of beautiful blocks! This sounds like a fun project to participate in! una idea preciosa y con un fin (ayuda victima terremoto) muy honorable. Suena muy divertido, así que si consigo hacerlo y enviarlo para la fecha te lo haré saber. Felicidades por ser como eres y por la feliz noticia de que vuelves a Japon. Thank you so much for telling about this great project! I am so happy I saw this- I am going to make a block! Your instructions are great! Good luck with your move! We are moving, too, but not to another country...none the less it is very stressful...what to keep? what to give away? We are downsizing A LOT! It is good to clear things out! I'm thinking! What to do? I think the bit I like best about this idea is that the quilts will be raffled off and given to the earthquake victims. oh what a fun and amazing idea! I love it, I'm in, thinking cap is on! I'll be getting started on mine soon , I love this idea . 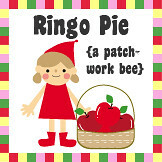 BTW have you come across this quilty/stitchy request at all... http://www.quilts4london.org.uk/ ... my daughter's Girl Guide unit is going to take part which is really exciting..
Ayumi, i love your blog and your work of course, please keep posting info about Japan also. My husband and i met in Tokyo in 2003 we miss it very much. you are lucky to move back. wow...it's so great event, but I missing...so sad. I hope you can keep made this event on next year!!! Please post some photos from the Tokyo quilt festival! it would be so amazing!